Even if I’ve never really considered myself to be a “dog person”, they’ve always cast a shadow in my life and in my heart. There is something about that happy soul, so glad to see a person that makes life better. And yes, cats and rats and bunnies and horses and all sorts of animals do the same thing. But for lots of folks, there is just something about having a dog in one’s life that makes things better. I’ve been thinking about my favorite boys and dogs a lot lately. Once, Mister Soandso and I got a dog. A former racer, Coral’s original family needed to rehome her 5 years after they rescued her from the track. Coral (that was her kennel name, her papers called her Ready to Raffle) was a great dog. When Biggest came into our lives, Coral quickly became his best friend. 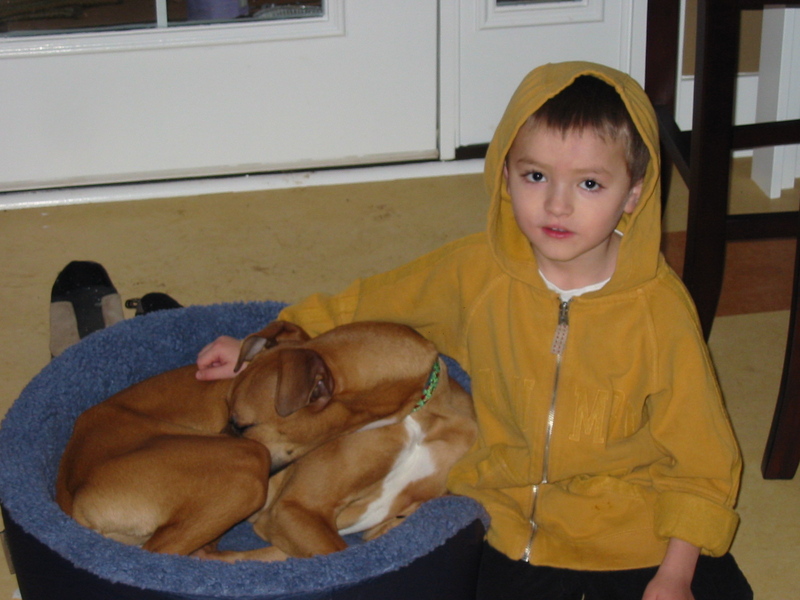 I think, just maybe, we got Coral for him…just a few years before we knew he’d need a dog like Coral. For three and half years, it was just the four of us…Mister Soandso, Biggest, Coral, and me. Who would blame Biggest for always picking Coral to be his favorite playmate in the house? After all, she was happy to clean his face, keep him company when he needed a nap, and play any game he could imagine for the two of them. She didn’t even mind too much when he was the cowboy and she was the horse. She may have sighed a few more times than usual, or even tried to distract him with other things, but in the end, she was game for anything the boy needed them to do. 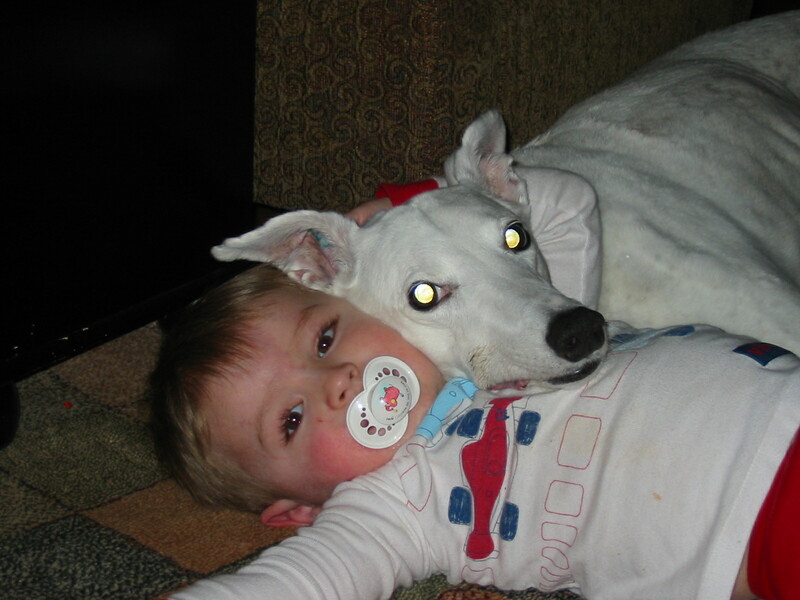 Yep, Coral was a good dog for this boy. 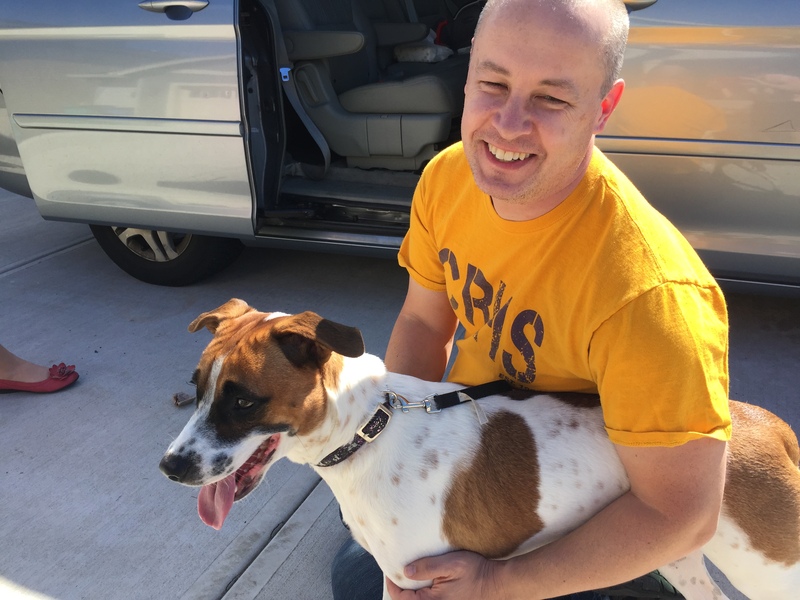 But as surely as boys grow up, dogs must also follow their rites of passages and one beautiful Minnesota September day, Coral left Biggest and crossed the Rainbow Bridge. Time passed until it was time to get the boy another dog. Not a dog to replace the empty spot in his heart, but a dog to help his heart grow big enough to love two dogs. And so Charlie came to live with us. And as a boy does, Biggest loved Charlie and spent most of his time making sure one part or another was holding onto Charlie…letting Charlie guide him from Kindergarten all the way through his freshman year. Charlie was very good for this boy. But it turns out, we didn’t just get Charlie for this boy. There is another boy who needed a dog too. Maybe even more than Biggest. A boy who missed his first dog and his second dog. A boy who missed having a dog by his side while walking through life. Charlie was good for that boy as well. 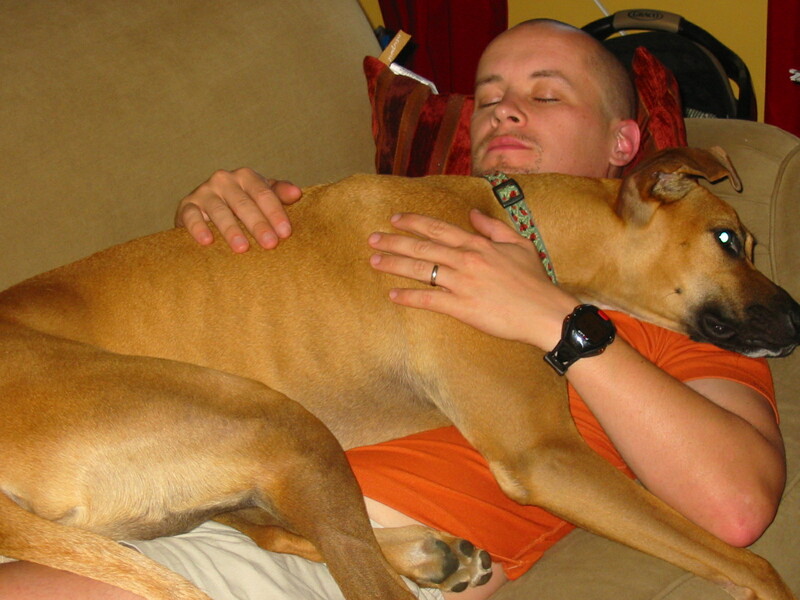 In fact, as the years passed, both these boys loved Charlie and grew hearts big enough for a 70 pound, Greyhound-Boxer mix who thought he was a lapdog. But the littlest boy, he had things to distract him a bit more than the bigger boy. And the big boy, Mister Soandso, found in the dog he got for his son a companion he wanted and needed. And Charlie found that he needed that big boy too. And what neither boy nor Charlie knew was that his days with his boys were drawing to a close. That for Charlie, the Rainbow Bridge was beckoning and that there would eventually be one last nap next to the lap his loved so much. It is a sad truth…the more you love a friend, the harder it is to let them go when the time comes. And yet you must. Because that is what it means to love…it means to cherish this moment and wish for one more than you get. 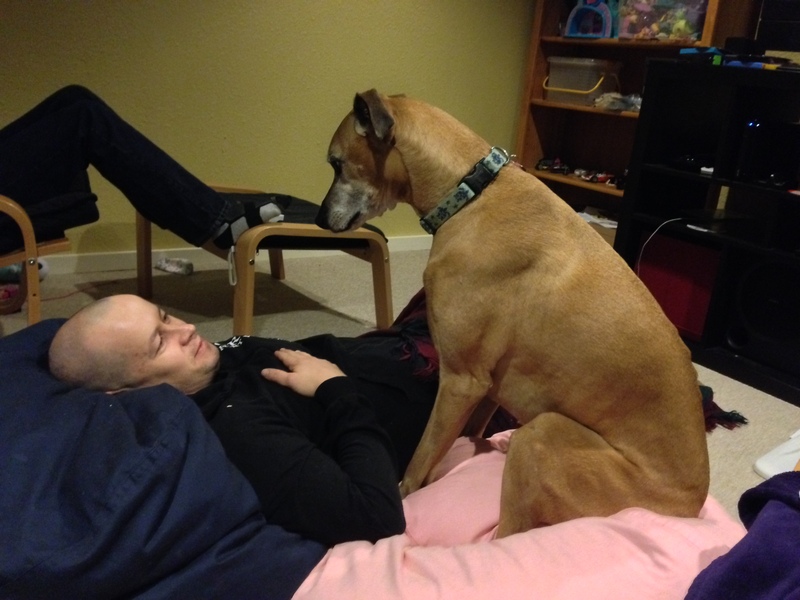 Charlie was a good dog and both these boys miss him. Both boys have Charlie-sized holes in their hearts. But honestly, I think Mister Soandso is the one who misses him the most. Probably because the hearts of teenagers beat a little faster than those in their 40s…they beat faster because they are distracted by all the things that distract teenagers. 40-year-somethings have hearts that know too well how much we need to appreciate each moment we get. Sometimes hurting hearts get a chance to fall in love with another dog who needs a boy to love. Far from our couch is another home with another couch and another boy with a sad heart. A sad heart who couldn’t keep his dog anymore. Several texts, phone calls, and lots of figuring later, Mister Soandso went on a road trip. With the help of his dad, Mister Soandso brought home a new friend. This is Molly. She too is part Boxer. We don’t know what the other half of her is but I guess whatever it is looks like a big love-bug because Molly is super sweet and loves nothing more than to give a person about fifteen more kisses than socially acceptable. I’d say this boy is happy. And Molly is too. Welcome home Molly. You’ve made two boys (plus one more boy and two girls!) very happy to meet you. Our hearts just got bigger. This entry was posted in family, Front Page, pet ownership and tagged Boxer mixed breeds, dog ownership, dog rescue, pets by kristina. Bookmark the permalink.